Cyrodilic Collections camp in Stormhold. Cyrodilic Collections is an organization dedicated to recovering Argonian relics and artifacts stolen from Black Marsh and returning them to their owners. 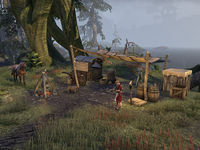 They have a camp on the outskirts of Stormhold and operate regular expeditions to Murkmire. The society also has an office in the city of Lilmoth, Murkmire, and is planning an ambitious expedition into a sunken xanmeer near the city. Cyrodilic Collections members in Root-Whisper Village. This page was last modified on 7 January 2019, at 06:49.